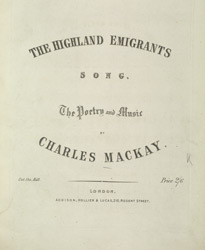 During the 19th Century there was a greater number of people moving out of Scotland, emigrating not only within the United Kingdom, but to countries such as Australia and America, this proved to be a great source of inspiration for composers and lyricists. Many tunes to come from Scotland during this period were played at ceilidhs and dances by performers who were paid with a meal or alcohol. To these fun and cheerful tunes, were added lyrics that would not embarrass the middle and upper classes and they soon became popular across Britain.